Valentine's Day rolled round this year and was fairly uneventful for me as per usual, what with the fact that the other half always works nights at weekends. One of the highlights for me though is the annual Diptyque celebration of love, which I held off burning until recently because I was scared of ruining that beautiful white wax candle. And seeing my money evaporate away into the ether. My thoughts on the candle: so prettyyyyyyyy!! 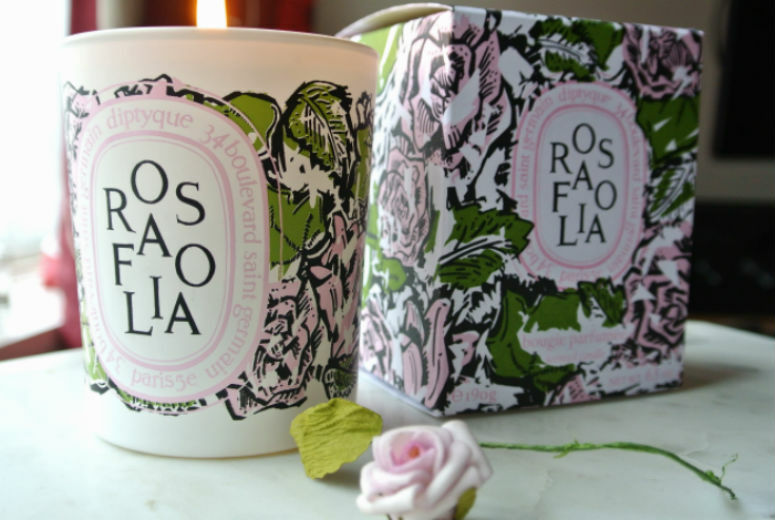 Both the box and the jar itself are gorgeous, with an ivy and rose motif printed all over. It's a much more vibrant look than last year's Rosa Mundi offering, which I absolutely adored and obsessed over. The print gives away a lot about the smell, a greener and fresher take on the standard Rose scent. The only thing is, I have not one, but two problems with this candle. Firstly, the jar feels so thin and fragile, compared to the usual jars Diptyque come in. Dare I say it, it feels....cheap, almost as if they used up the budget on each candle on the print and cut corners on the jar. Secondly, the throw. The throw is terrible in my opinion. I live in a dinky flat and could barely smell the candle the first time I burnt it, only noticing it when I walked next to it. The second time there was some improvement, but barely. If I'm spending £40 plus on a candle, I want to be smacked in the face with the smell and left with my jaw on the ground, not daring myself to see how close to a naked flame I can put my face just to get some perfume scented highs. So, my thoughts overall? A pretty and pleasant enough candle, but am I keen to go and buy a spare before it's too late? No, I think I'll be saving those pennies, and try to avoid sending them off into the ether with the smoke.